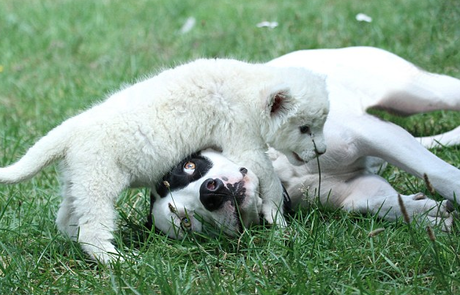 Pointer mix adopts a white lion cub. Lejon and JoJo act like any other father and son, but they sure are an unlikely pair. JoJo is a rare white lion cub, born into captivity at Zoo Safaripark Stukenbrock, a wildlife park in northwest Germany. Lejon is a dog—a 2-year-old Pointer mix. JoJo had to be separated from his mother, Nala, shortly after his birth because of an infection created by the umbilical cord. “After days of treatment we were not sure whether the mother would accept her baby,” park worker Jeanette Wurms explains. When the infection was sufficiently healed, workers attempted to reunite the lion cub with his mother. Sadly, Nala rejected her baby, which meant that JoJo would have to be left in the care of the safari park workers if he were going to survive. When Wurms brought little JoJo home with her that evening, it was the zookeeper’s dog that took over caring for the little tyke. Wurms still has to take over feeding duties, hand feeding JoJo daily, but the little white lion gets all the paternal affection he needs from his buddy Lejon. The two have become inseparable. “I am glad that JoJo has found something like a stepfather and stepbrother in my playful and loving Pointer-mongrel Lejon,” Wurms says.